In the pell-mell of life, who has not sometimes felt overwhelmed? The mind seems to be in an endless churn...leading us in circles of despair, anger and frustration... Where do we turn when we are floundering? The answer lies within. 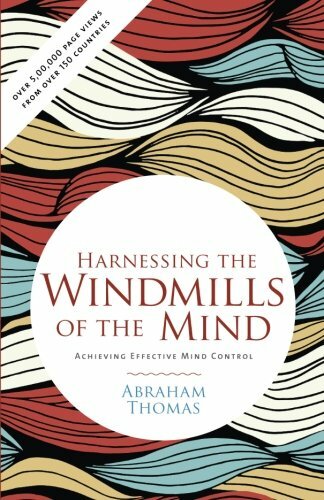 Windmills offer practical and sustainable ways forward through Effective Mind Control (EMC). These pages abridge the behavioural aspects of the AI thesis about the mind on the Effective Mind Control website. EMC has drawn keen interest from around the world, logging over half a million page views from over 150 countries. EMC assumes that IA, an intuitive algorithm, enables the mind to apply inductive reasoning to manage attitudes and behaviours. Windmills suggest simple mental and physical exercises, followed by wise men across the centuries, to change our own views and actions...pointing the way towards a positive life experience. The review of this book has been long due. I had received a review copy of the same from Leadstart Publishers. Actually, I had chosen this title from a list of books they had to give way for review. The reason why I was interested in this particular book was the tagline of the book – achieving effective mind control. Well, who doesn’t want to have a full control over their minds? All of us and we all know that it is a herculean task. As I read this book I realized that you cannot read it in a go. The book is thought-provoking and you have to slowly soak in the nectar of the book. And also unless you apply what you have learnt through the book, you can’t give your opinion about the same, right? That is one of the many reasons (travel, blogging block, Diwali, etc., among others) why it took me so long to write about it here. The author has described the human brain as a composition of millions of windmills that control how we are, how we behave and how we live our lives. If we can guide and have control over these windmills we can take charge of our lives. And this can be done by following some mental and physical exercises. Sounds easy, right? But, to be able to practice them in everyday lives needs a person’s willingness to change, patience and above all discipline. The author has touched on every aspect of our lives, the problems and dilemmas we face – sadness, guilt, fear, disappointment, anger, impatience, low self-esteem and more. All these take a toll on the quality of our lives and make us show the futility of our meaningless lives. The irony is that the solutions to all our problems lie within us. But we do not know how to go about it. That is what the book shows us - with the help of breathing exercises, mindfulness exercises the book shows us some ways that can help in fostering positive thinking and a positive attitude towards life and help us fight our own demons. While I can say the content of the book is great, I wish it was written in a different way. At some point, it starts to sound boring. If it had been written like a practical workbook, it could have been utilised better by the end users.